LOS ANGELES - Feb. 22, 2019 - PRLog -- The United Premier Soccer League (UPSL) is excited to announce Bat Country Football Club as a new league member kicking off with the 2019 Spring Season. Based in Temple (Texas), Bat Country Football Club will begin play in the UPSL Central Conference, and will host its UPSL home games at Woodson Field (670 W. Elm Ave., Temple, TX 76501) in compliance with UPSL Minimum Standards. 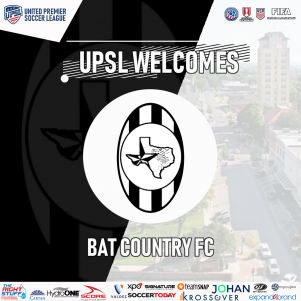 United Premier Soccer League National Director Matt Kahla said, "We are pleased to welcome Bat Country Football Club to the UPSL Central Conference. Owner Tristan Long has played the game at a high level and now he's back in the town where he grew up and making a difference on the local soccer scene. We support his efforts and are excited to see Bat Country FC in competition this season." Tristan Long is Owner and Head Coach of Bat Country Football Club. A native of Frankfurt, Germany, Long holds a UEFA 'B' Coaching License and Bat Country FC previously functioned as part of Long's personal-training program for college-age players and participated locally in city leagues. Bat Country Football Club Owner and Head Coach Tristan Long said, ". We are optimistic we can be the catalyst for change in this community in helping connect kids to big college programs as well as the professional leagues I've known Mario (Alcala) and Sergio (Alcala), owners of Inocentes FC, from playing together since we were kids and they convinced me with their success that the UPSL is where Bat Country FC needs to be. It's been cool to see how they have grown, and hopefully we can make the playoffs and come head-to-head against 10 years on." Long lived in Temple (Texas), as a youth and played club soccer and high school soccer before a one-season stint with Eintracht Frankfurt u16s. He returned to Texas and played at Tyler Junior College and Lubbock Christian University before heading back to Germany to play for Eintracht Frankfurt u23s and later in Denmark for B.93 and Frederiksberg BK. "One of the biggest problems for players in a place like Temple is lack of exposure to high-quality soccer and the opportunity to learn and train with coaches and players who have gone the distance and want to pass on their knowledge to the next generation to help them reach their goals," Long said." Bat Country Football Club is an American Soccer club currently based in Temple, Texas, and a new member of the United Premier Soccer League. Bat Country Football Club will play in the UPSL's Central Conference. Founded in 2016, Bat Country Football Club can participate in the qualifying rounds for the Lamar Hunt U.S. Open Cup through their affiliation and membership with the UPSL, the U.S. Soccer Federation (USSF) and the United States Adult Soccer Association (USASA).